Susan Ojukwu was born and raised in Albany, New York. 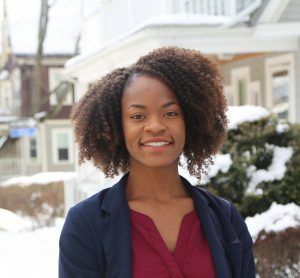 She graduated from the University of Rochester in 2017 where she was an International Relations and Public Health dual major. Susan served in leadership roles on campus as a Student Alumni Ambassador, Vice President of the Black Students’ Union, and member of Delta Sigma Theta Sorority, Incorporated among other activities. Her studies have taken her to France and to Hong Kong where she gained fluency in French and explored Chinese foreign policy. Susan’s first visit to her father’s village in Nigeria was a journey that ignited her passion for the study of international health. Hoping to better understand the political drivers of extreme poverty, inequality and human development, Susan conducted undergraduate research on strengthening health systems and food aid in West African countries. Through AmeriCorps, Susan served as a diabetes management intern and her enthusiasm for public health continued to grow. She aspires to work on the front lines improving healthcare delivery, building local capacity, and expanding access to the most vulnerable populations around the world. She is eager to continue her education and is confident that the quantitative tools she will acquire in graduate school will prepare her for this career path. Susan will pursue a Master’s in Public Health – International Health. She sees the Payne Fellowship as the perfect opportunity to combine who she is and what she loves as she prepares to enter the professional realm of global health. She is excited for the opportunity to become a Population/Health/Nutrition Officer in the USAID Foreign Service.